Every one knows that in order to perfect a skill, you need to experience times of difficulty. That way you can discover how to solve problems and be able to creatively apply solutions in new situations. That is exactly what this sentiment is saying. I used this great Technique Junkie stamp from the stamp set By the Sea SS060 - www.techniquejunkies.com/by-the-sea-set-of-6/. I paired it with the Technique Junkie Van Gogh's Sailboat - http://techniquejunkies.com/van-goghs-sailboat/. It is layered on dark brown card stock. I colored the focal image of the sail boats with Copic markers. The saying is stamped with an archival black ink. The base card is a soft blue card with a dark brown layer. Technique Junkie Sea Waves - http://techniquejunkies.com/sea-waves/ - is stamped on another soft blue card stock as the top layer of the base card. A dark brown grosgrain ribbon is wrapped around it. Have you ever sailed a sail boat? Have a great day and get inky! At one time or another, nearly everyone is fascinated by mermaids. And when we were children we may have pondered if there was even a remote chance they could be real. 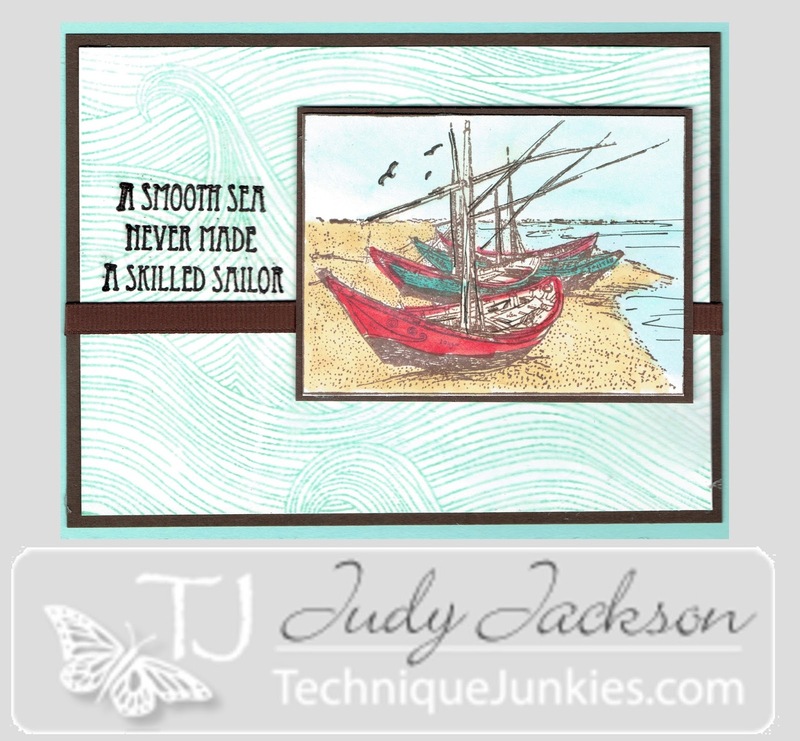 All of the Technique Junkie stamps used on this card are from the stamp set By the Sea SS060 - www.techniquejunkies.com/by-the-sea-set-of-6/ . I die cut the mermaid tag from white card stock, and die cut two of the soft blue card stock so i could make a proper frame for the mermaid tag. I sponged a variety of colors to simulate colors in the water including the reflection of the sun. Then I used black Versafine ink to stamp the mermaid and the verse on vellum. I covered the mermaid with an iridescent clear embossing powder so she has a sparkle to her -- which unfortunately you cannot see in the scan. The verse was covered with clear embossing powder and both were heat set. I used clear instead of detail black powder because the script letters in the verse are on the smaller side and close together. If I used black embossing powder the letter would have a tendency to smoosh together and make ti difficult to read. Using clear embossing powder helps to prevent this from happening. I used a piece of background paper from my stash that looks like waves on the sea. I used my Xyron machine to put adhesive on the back of the vellum to adhere the vellum to the card stock. Ribbon is tied on the tag as an embellishment and the whole tag is popped up with dimensionals to add visual interest. Did you ever pretend to be a mermaid at the ocean or in a swimming pool? Friends are so important in our life. Doing things with our friends is one of the things that adds quality to our lives. Here are two long time friends (in my imagination) standing together on the boat. They are sharing some quality time by the sea! Technique Junkie stamps By the Sea SS060 - www.techniquejunkies.com/by-the-sea-set-of-6/ , and Old Friends - http://techniquejunkies.com/old-friends/ are used. Once again I cut off the saying in the Old Friends stamp in order to make it easier to stamp the scene without the words. However, I left it "like a puzzle" so the saying will fit back into the stamp as though I had not cut it off. I used a finger dauber and some yellow ink to swirl the sun in the top right corner. The sky is sponged. I inked up the Old Friends stamp with Memento Rich Cocoa. Then I took a cloth and wiped off the brown ink on the ocean. I inked that with a blue dye based marker direct to rubber. The boat and the friends are colored with Copic markers. 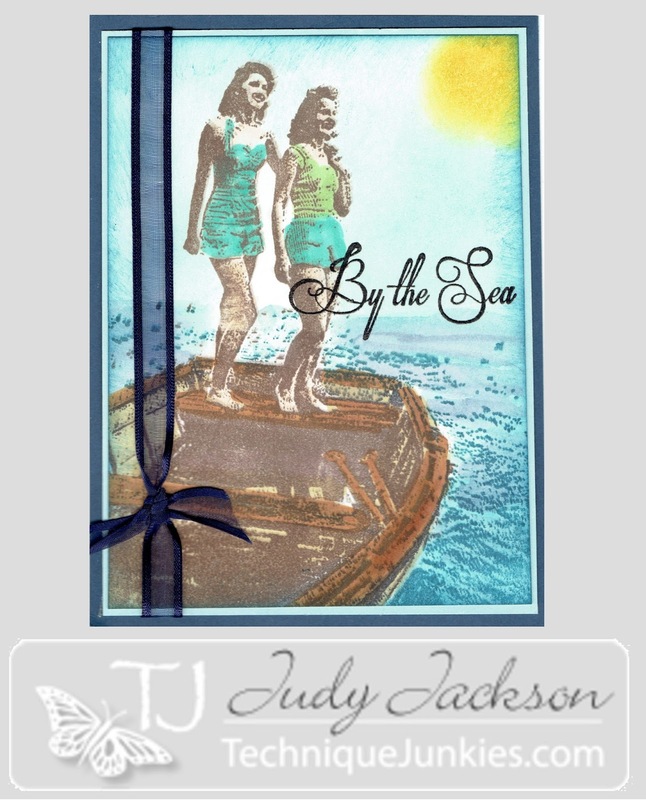 The saying By the Sea is heat embossed with detail black embossing powder. Have a great day -- and contact an old friend! And get inky. Here we have the Technique Junkie June release of Fishing Boat S676 - www.techniquejunkies.com/fishing-boat/, and Beachin' It - SDX074 - www.techniquejunkies.com/beachin-it/. The Fishing Boat stamp was stamped on a two inch wide by 5 1/8 inch long white panel. It was layered on a black panel to frame it. The focal image was colored in with Copic markers. It was layered on a white panel, layered on a black panel, and then layered on the red base card. The saying was stamped with black Versafine ink and then heat embossed with detail black emossing powder. It was punched out and then I punched out another in black. I cut that black punch out in half in order to frame the Beachin' It punch out. 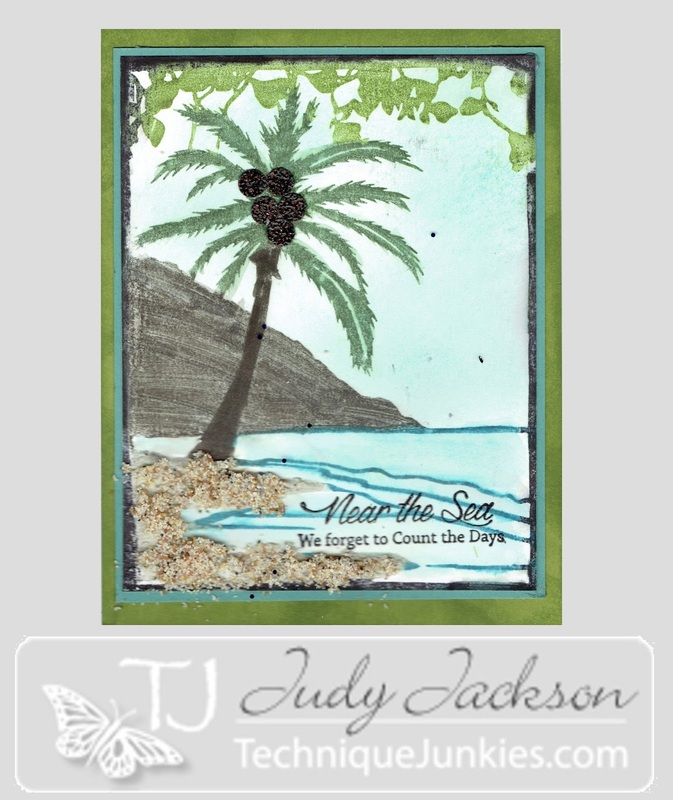 Have a great day - at the beach or no -- and get inky! 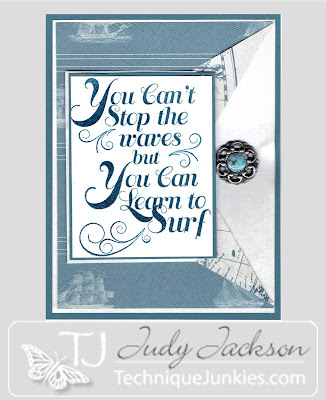 I tried a different approach with this card using Technique Junkie Pebble Beach S699www.techniquejunkies.com/pebble-beach/. The verse is Beach Day SDX071 - www.techniquejunkies.com/beach-day/. I stamped the image with Memento Flannel Gray ink on a light tan card stock. I colored the starfish and the shells with Copic markers. I used a gold Wink of Stella pen to further highlight the Starfish and parts of the two larger shells. I layered it on gold metallic Star Dream text weight paper, and then on dark brown card stock. 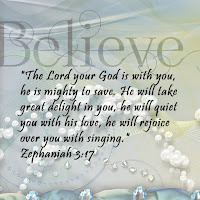 I stamped the verse with white pigment ink and heat embossed with white pigment embossing powder. The verse is stamped on the dark brown card stock and layered on gold Star D\ream tex weight paper and popped up with dimensionals. Three areas of tiny shells are attached for texture and visual interest. You can look for a star fish at the beach -- and get inky when you come inside. 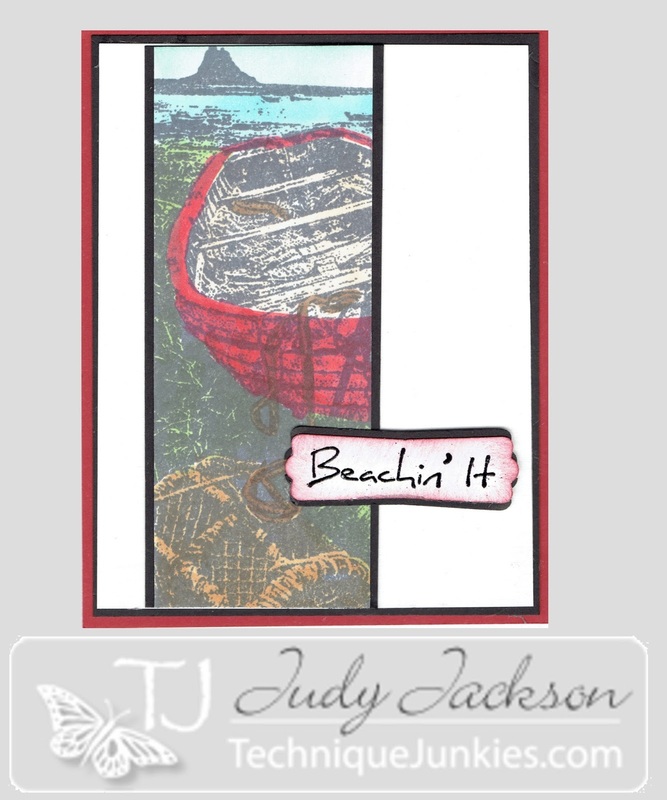 How could I make all of these beach and ocean themed cards without including a favorite Technique Junkie stamp Beach Girl http://techniquejunkies.com/beach-girl/? She is colored with Copic markers and her hat and clothes, the sun and its rays are then highlighted with a Wink of Stella pen. Sand and tiny shells are attached for the embellishments. 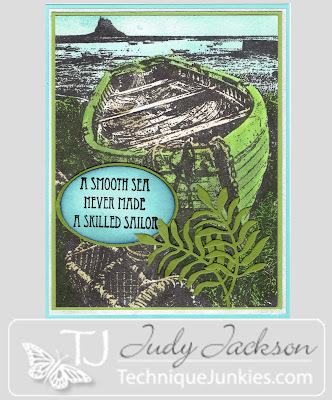 The words are from the Technique Junkie Stamps By the Sea - www.techniquejunkies.com/by-the-sea-set-of-6/. Technique Junkie stamp Sea Waves http://techniquejunkies.com/sea-waves/ is stamped on the panel adhered to the base card Lace is wrapped around this panel. I would love to just be sitting and watch a sun set at the beach, wouldn't you? But that won't happen today -- so get inky! Have you ever made a card a just struggled with it? That is what happened with this card. I tried two approaches at first and neither satisfied me. I had to rethink what I was doing and do something totally different from what I started with. The tag used to be a whole panel that I trimmed down for a tag. Sparkles, shells, ribbons, and a faux button were attached to the tag. I wish you could see the white panel. It is a shimmer paper that has swirls almost like ocean waves - beautiful. Float away on the waves -- and then get inky! This lovely Fishing Boat stamp is, of course, a new Technique Junkie June release stamps called -- appropriately - Fishing Boat S676 -www.techniquejunkies.com/fishing-boat/. 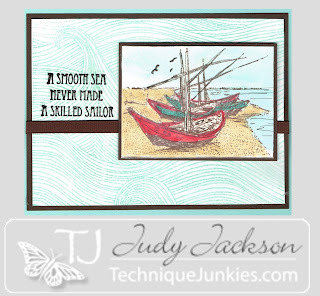 The saying is always a Technique Junkie stamp from the set of 6 stamps called By the Sea - SS060 - www.techniquejunkies.com/by-the-sea-set-of-6/. The fishing boat and background scenery is colored in with Copic markers. The smooth sea staying is stamped then punched out and the white card stock in sponged with blue. I punched out two green ovals to cut in half and then layer on the back of the verse to create a frame that goes all around. I die cut two ferns and over lapped them for visual interest and texture. I highlighted them with a Wink of Stella pen. Unfortunately, that doesn't show up in the scan. So are you a good sailor by this definition? I know I am not -- so let's get inky! The new Technique Junkie Stamp called Pebble Beach - www.techniquejunkies.com/pebble-beach/ - has an unusual visual texture to the starfish in the center of the stamp. And it stamps very beautifully! I wanted to create a panel instead of a full card with the stamp. I thought that would create the effect I was going for. I stamped the image with Memento Espresso Truffle. I colored inthe images with my Copic markers. 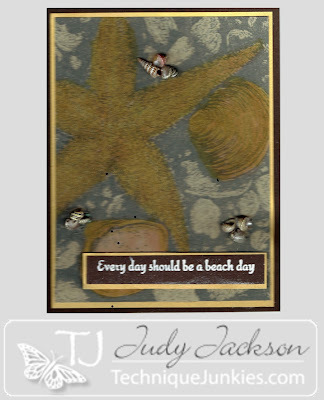 For the starfish, i used a pale pink or coral color and i used a light gray on the edges to create dimension. 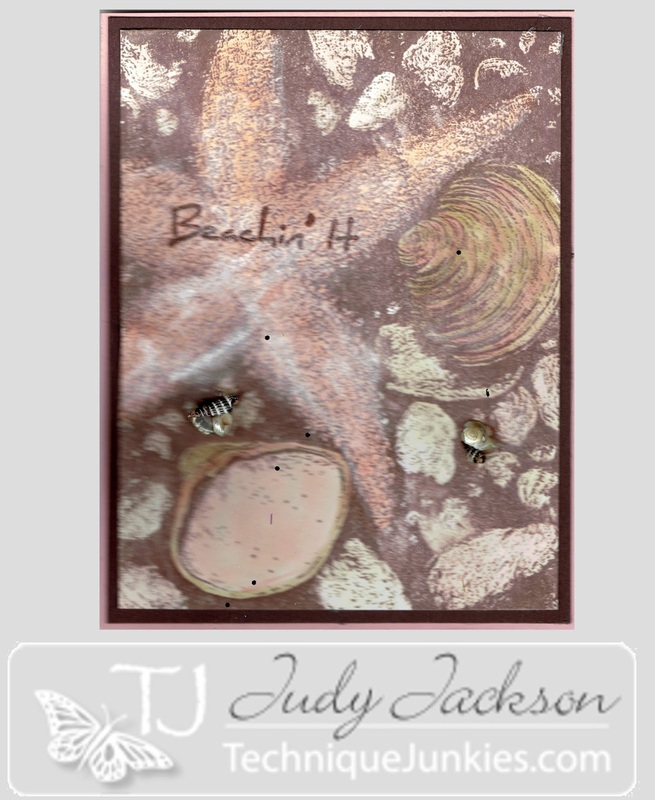 I used a embossing folder that looks like shells to me with dark brown card stock. I placed the embossed piece on a pinky-coral card stock. I tied a ribbon around the panel and added a few pearls with some silver cording. Have you ever stamped with panels such as this before? 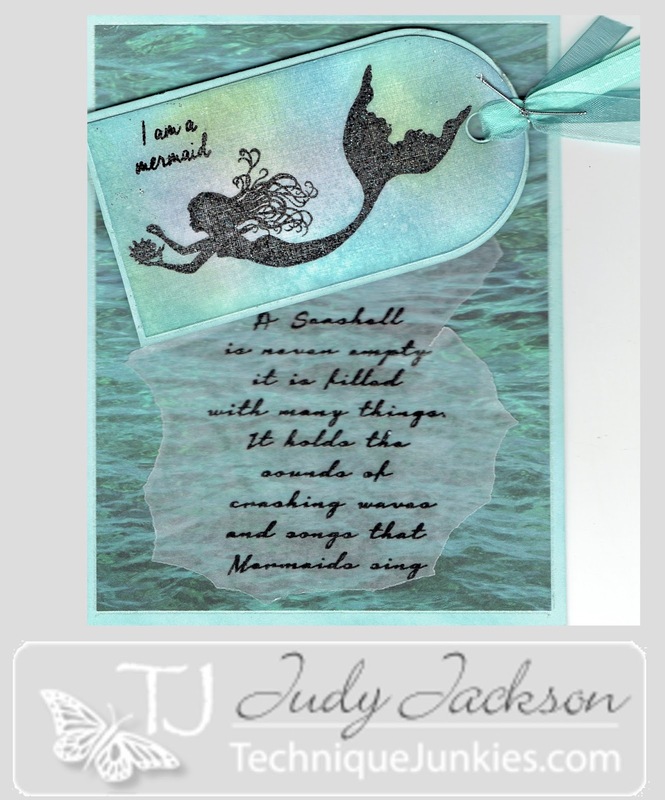 Using the same image twice on one card is a fun thing to do - especially when you have this lovely solid mermaid image in the Technique Junkie Stamps set By the Sea - www.techniquejunkies.com/by-the-sea-set-of-6/ . So I stamped her twice and heat embossed her with clear embossing powder each time. I also heat embossed the saying as well. The saying is in this stamp set as well. I used a 4 1/4 by 5 1/2 inch panel with the Antique Glimmers technique. For inks I used 3 different shades of blue and one purple. I used my heat tool to dry the card stock before die cutting it. I lined up the card stock on the die as closely as I could to have some left over card stock for the saying. I die cut a piece of light purple card stock and cut it in half to create a frame at the top and the bottom. I wrapped a ribbon around the die cuts and adhered the ends to the back side. Then I tied a bow with my Bow-It-All and adhered it with a glue dot. When I placed all of the die cuts on the card stock base, it seemed bland and need something. So I took the coordinating ink pads (a blue and a purple) and just swiped the edge of the ink pad on the card stock. I used the blue ink first and then the purple ink. Doing that created a simple background that distract from my focal image. I got a variety of texture and shades where the ink colors overlapped or were by themselves. Have you ever done this swiping technique with ink pads? I enjoy making cards that will surprise the person who receives it. This one has a vellum pocket and a tag behind inside it. 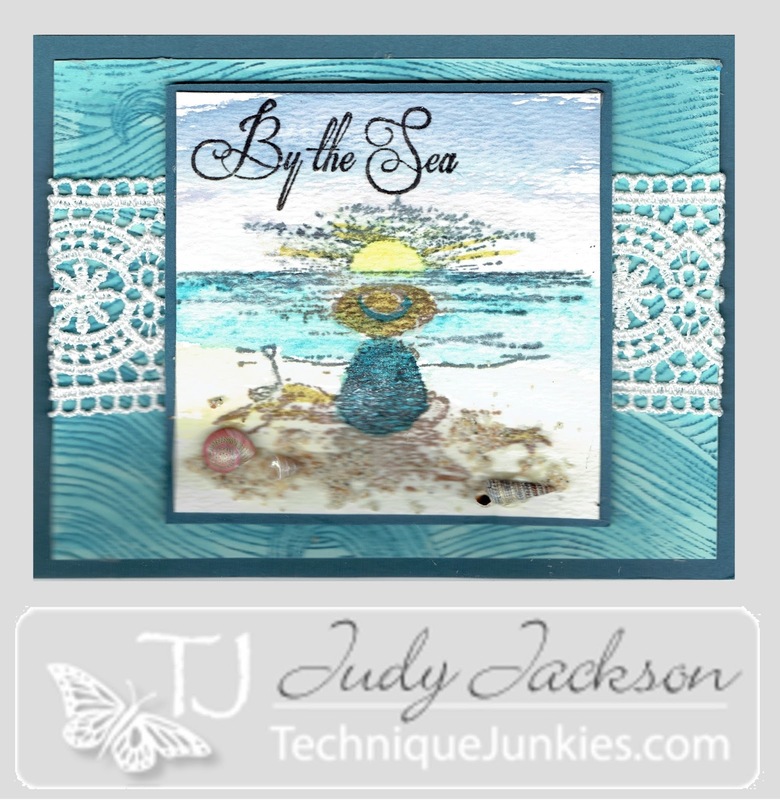 I used several Technique Junkie stamps to create this card: By the Sea SS060 - www.techniquejunkies.com/by-the-sea-set-of-6/ , and Sea Waves S628 - http://techniquejunkies.com/sea-waves/. I tore thin strips of a pale blue vellum and adhered those strips on the backside of thin white vellum. The narrow blue panels at the top and bottom of the card help to create the pocket for the tag to slip in and out of. I stamped the words from the Near the Sea from the set By the Sea repetitively on the front of the vellum pocket. 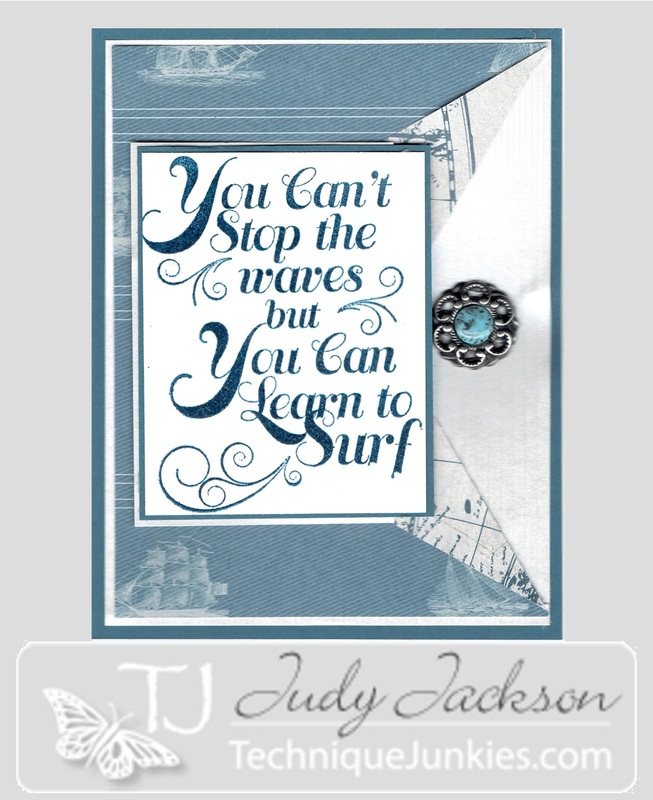 The base card is stamped with Sea Waves. The Tag is also stamped with Sea Waves and then the mermaid is stamped over the waves. It was inked with black Versafine ink, covered with detail black embossing powder, and heat set. The focal verse is also from the stamp set By the Sea. Ribbons were tied to the tag to pull the tag in and out. Have a wonderful day -- may the beach be in your future this summer! And get inky! I have a good friend who loves the beach and is totally energized by being at the beach. I know she would love to say that she needs a daily dose of Vitamin Sea! So with that in mind I created this card. I stamped the Technique Junkie Beautiful Conch image S667 - www.techniquejunkies.com/beautiful-conch/ with Memento Rich Cocoa ink. Then I used Copic markers to color in the conch. I sponged color for the sand and the sky. I used a brown marker and added ink direct to rubber on the "flecky" area of the stamp Oak Relief - S641 http://techniquejunkies.com/oak-relief/. I stamped that flecky area to the sponged sand area to add visual texture. 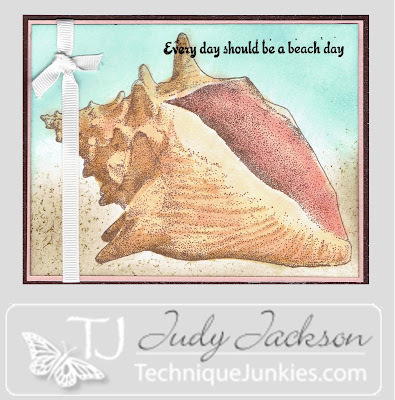 The verse is a Technique Junkie stamp called Beach Day - SDX071 - www.techniquejunkies.com/beach-day/_. So if you cannot get to the beach -- well then stamp. Have a great day and get inky. 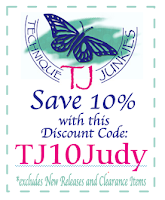 The Delights of New June Stamps -- and a SALE! We think of June as the beginning of summer. And where I live -- summer means the beach and the ocean for many people. I live only a few hours from the Atlantic Ocean. I was so excited to see that ALL of the Technique Junkie Stamps June releases are all ocean and beach themed. So sit back and enjoy thoughts of summer and the beach. And as always, Pat Huntoon has a 15% off sale on all new June releases. And just in case you don't notice this -- there is also a clearance section of both stamps and accessories. So have a look. You just might find something you didn't know you really need. This Technique Junkie June Release blog hop begins with http://techniquejunkies.blogspot.com/. And officially the Blog Hop starts at 9:00 Eastern Daylight Savings Time. And I have a contest so please read to the end! This first card features a large Technique Junkie background stamp of a Conch shell (Beautiful Conch - S667 - www.techniquejunkies.com/beautiful-conch/) which I stamped with Versafine Vintage Sepia and used clear embossing powder. After it was heat set I painted the shell with slightly thinned Art Anthology Gel Medium paints. When the gel medium was completely dry, I used two shades of Colorations sprays - a light brown for the beach sand and a light blue for the sky. And of course, I wiped off the excess spray with a paper towel right away. 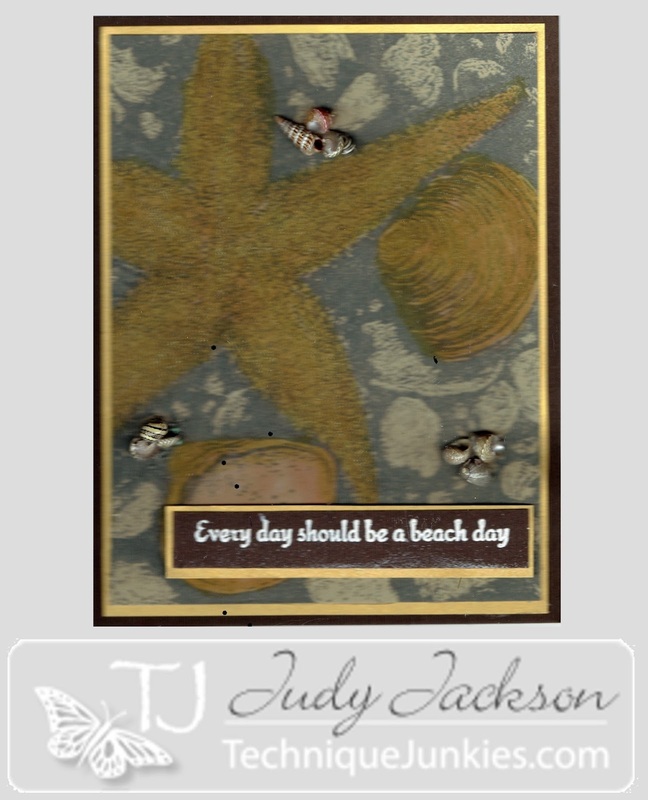 I layered this background panel on chocolate brown card stock. 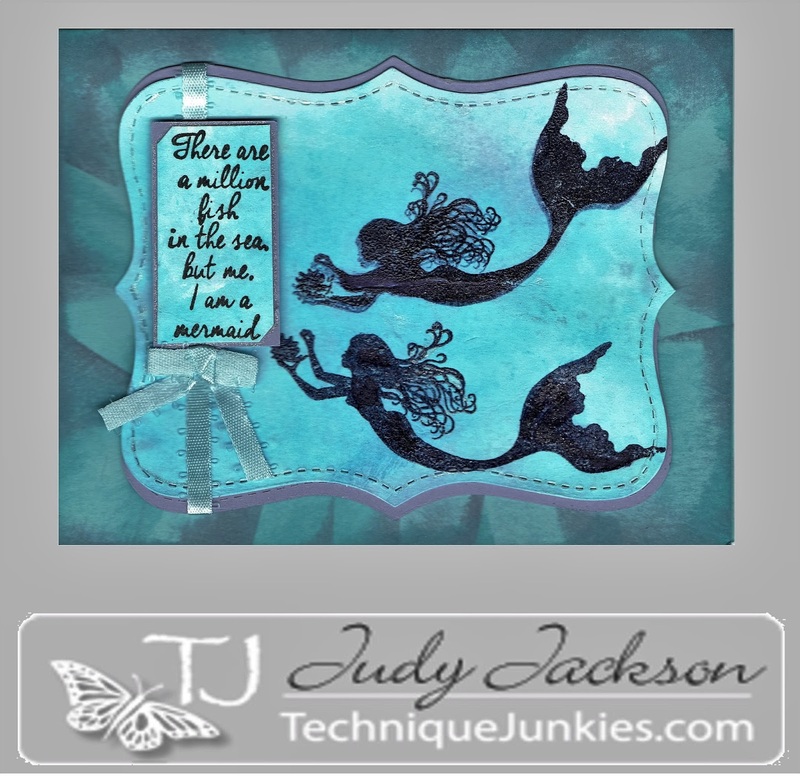 After tying a lovely ribbon around this panel I layered it on an ocean blue card stock. The mermaid and the coordinating poem (Technique Junkie By the Sea - SS060 - www.techniquejunkies.com/by-the-sea-set-of-6/) were stamped on vellum and heat embossed with black detail embossing powder over Versafine Black ink. I can hear the mermaid calling in the sounds from the conch shell, can you? 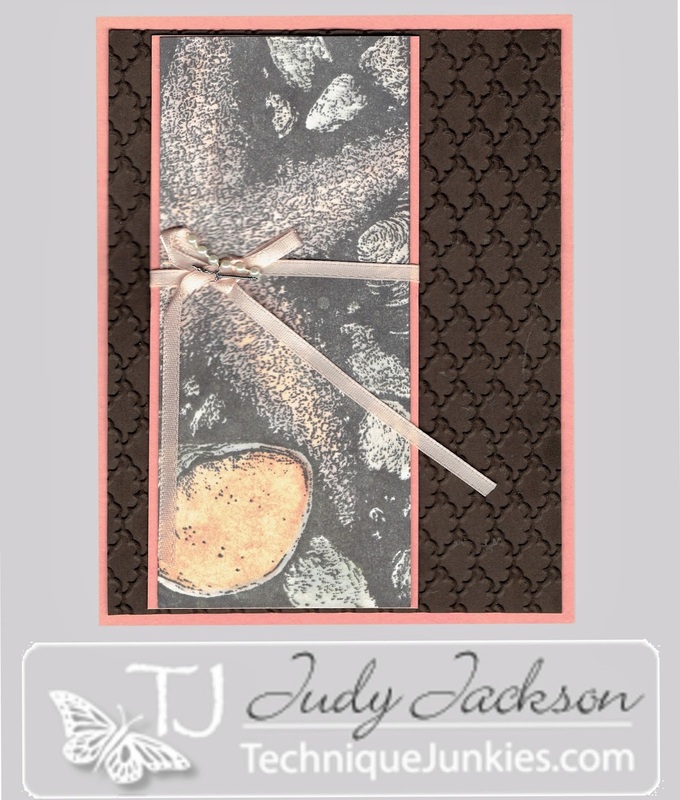 This card uses old and new Technique Junkie Stamps. The old stamp is Technique Junkie The Tropics S150 - http://techniquejunkies.com/the-tropics/. 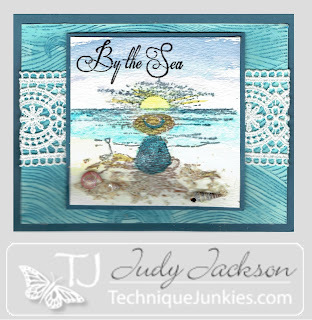 The new stamp is from By the Sea SS060 - www.techniquejunkies.com/by-the-sea-set-of-6/ . I used Shimmering White card stock so there is a subtle shimmer to the image. I used direct to rubber with markers right on the stamp. I "huffed" to re moisten the marker ink and stamped, I used a water pen to pull the color from the ink on the lines of the ocean. The background hill needed to have the color moistened and spread around with the water pen as well. The trunk of the palm tree needed more color so I added that. I wanted to create a few coconuts for the tree. I pressed my Versamark pad on a scrap of brown paper. Then I covered that ink with some variegated brown embossing powder and heat set it. I punched out circles with a 1/4 punch glued them on the tree.I stamped the saying with black Versafine ink, covered with clear embossing powder, and heat set. I spread some sand in glue on the beach and let it dry well. It totally has the feel of the beach and ocean. I can just picture being there in my mind. 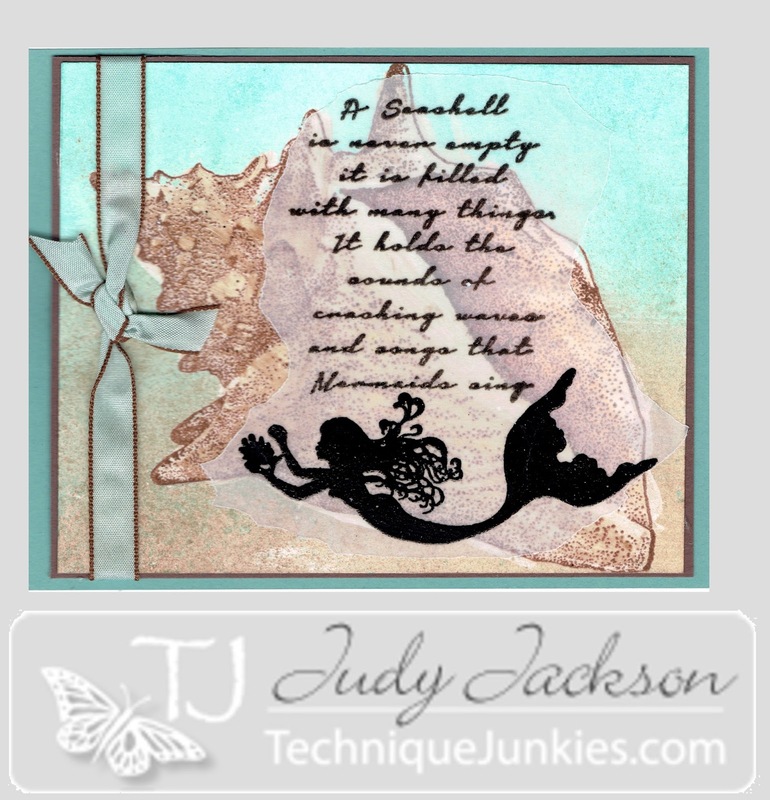 This wonderful new Technique Junkie stamp is called Pebble Beach S699 - www.techniquejunkies.com/pebble-beach/. I also used the other new Technique Junkie stamp release Beachin' It - SDX074 - www.techniquejunkies.com/beachin-it/. I colored the starfish and the larger shells-- and some of the smaller shells with Copic markers. Then I painted some glimmer mist over the star fish and larger shells. I layered the central panel on brown and then peach card stock. The words were stamped with Versafine Vintage Sepia ink, covered with clear embossing powder, and heat set. Tiny shells in a glue medium were added in a couple of spots to add texture. This "Collar Fold" technique is relatively new to me. I learned it from friends in my local friends Wednesday stamping group. About 4-5 of us get together every week to stamp, and chat. We do some stamping and a lot of chatting. One of those friends, Pam, learned a new technique from another friend. It is pretty basic and relatively easy. On one long side of background paper find the mid-point. Make a slit about 1 3/4 inch in at this mid point. Then score a fold line from the end of the slit to the corner of the background paper and gently fold back. Add a small amount of adhesive under the folder "shirt collar." You do not want to adhere the whole collar because leaving it slightly "up" you get more visual texture. You can use certainly use a greeting where I added a button. You want to be sure that your slit and then folded collar area allows enough room for your chose greeting. 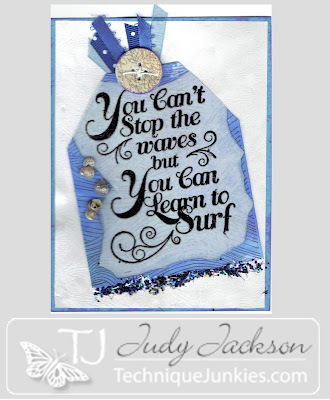 I made my focal image be the words on the new Technique Junkie stamp Learn to Surf -SD681 - www.techniquejunkies.com/learn-to-surf/. To create an emboss-able image i first inked the stamp with Versamark ink, and inked up the stamp with a deep blue dye based ink. I added clear embossing powder and heat set it.Therefore I didn't want to add another greeting so I used a fancy button and used my special snips to cut off the loop on the bottom of the button where you would sew it on to the fabric. I used a striped shimmer paper for the bottom layer on my card base. 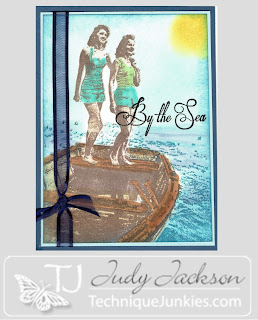 A nautical background paper added to the ocean theme of the stamp. Last month I had a contest as well. 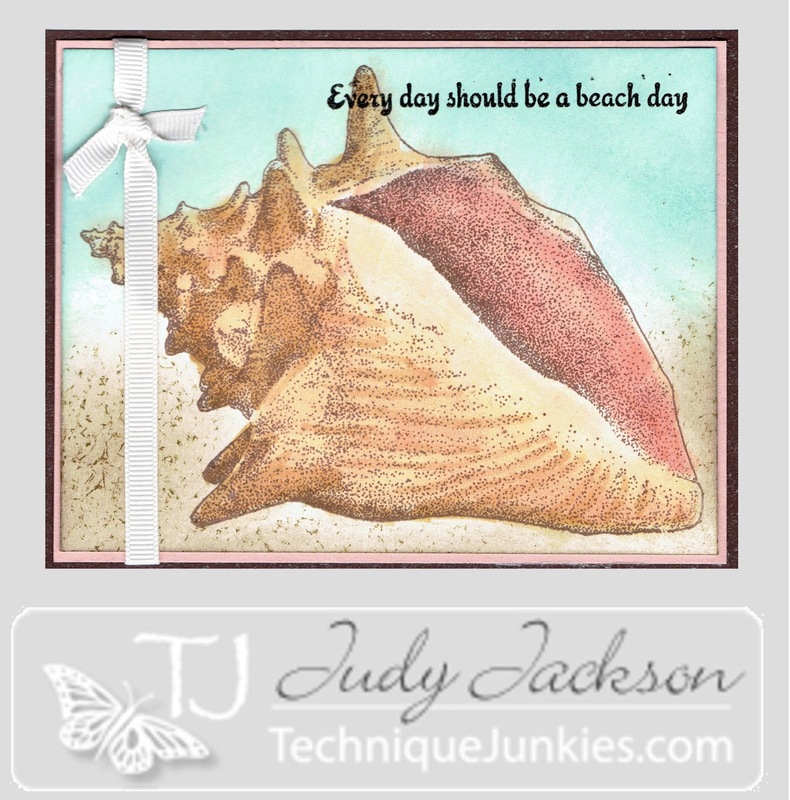 I will send a card I have made with one of the new Technique Junkie June release stamps to one person who makes a comment on this blog post. You must make your comment by June 5 by 5:00 PM. Usually I can discover the email address of the person writing the comment. But if I cannot I cannot send you the card because I cannot contact you. So you may want to add your email address in your comment. Please do it safely by writing your email address like this - janedoe at 123 dot com. This way your email address is more difficult for email harvesting hacks to harvest your email address from my blog. I always find it so interesting to go through a blog hop and see the different ways and ideas the different designers have with the same colors -- or as in the TJ Design Team -- with the same stamps. Pat doesn't send all of the newly released stamps to every Design Team member. But several of us get the same stamps. So please continue through the Blog Hop to see how each designer uses these wonderful stamps. And don't forget -- ALL of the JUNE release stamps are on sale for 15% off through June 8. Tonya Davidson: http://stampintonya.blogspot.com - Your next stop. And don't forget my contest! You just might win a card! Please leave a comment below.